1.Ogle-2005-BLG-390Lb at 25.000 lightyears in Sagittarius, the most Earthlike planet yet [since 11 july 2005] discovered, with a mass of 5.5 that of our Earth! 2. Near HD 98618 [Twin Sister of our Sun] at 126 lightyears. Twinlike solar system, 26.000 lightyears from the galactic centre, provides conditions for finding an 'Earthlike planet'. 3. Near the Sun-like [Lum. 0.93] star HD 70642 in the constellation of Puppis at 90 lightyears, a Jupiter-like planet in a 6 year orbit around its parent star, makes a second 'Home' or 'New Earth' a possibility. 4. Near 18 Scorpii, 4.2 billion years old at 46 lightyears away from Earth. (45.82 ly), visible in the night sky close to the Scorpion's left claw, provides the oppurtunity to find an 'Earthlike' planet in such a Twinlike solar system with a sunlike-star, close to ours, also 26.000 lightyears away from the galactic centre. 2 % of the stars in our galaxy are sun-like, that's a lot under many billion stars. 5. Mu ARAae is a star visible in the Southern constellation ARA [Altar] at 50 lightyears. In a discovery European astronomers have found one of the smallest planets known outside our solar system, a planet about 14 times the mass of our own Earth [a great Brother of our Earth], circling around a star much like the Sun. MSNBC, SpaceCom: Super Earth found circling nearby star. It could be a rocky planet with a thin atmosphere, a sort of "Super Earth", that completes its tight orbit in less than 10 days, compared with the 365 required for our Earth. Hot as in around 1.160 Fahrenheit [900 degrees Kelvin]. Mu Arae harbors two other planets. One is Jupiter-sized and takes 650 days to make its annual trip around the star. The other planet with 14 times the mass of Earth is a rocky planet, circling Mu Ara in size and brightness to our Sun, is about as heavy as Uranus, a world of gas and ice and the smallest giant planet in our solar system. Theorist say 14 Earth-masses is roughly the upper limit for a planet to remain rocky, however. And because this planet is so close to its host star, it likely had a much different formation history than Uranus. In our solar system, the four innermost planets are all rocky. 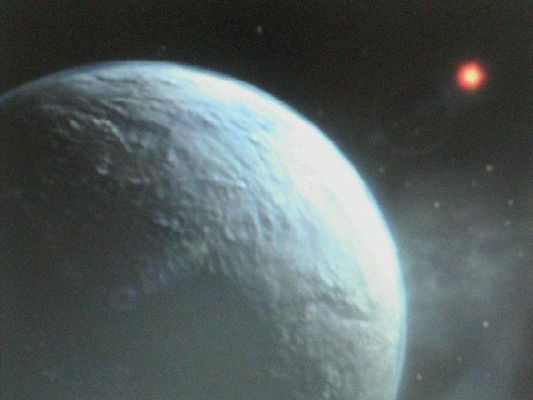 Santos said life on this "Super Earth", is not likely. But he added, "one never knows". 6. 58 Eridani, only 400 million years old, visible in oktober-januari, in the constellation of Eridanus, remains at 44 lightyears [43.44 ly] and matches exceptionally close to our Sun in overall properties [like Zeta Tucanee and Alpha Mensae], but 58 is the most Twin-like and Sunlike in all aspects. Astronomers are hoping to find a rocky inner planet in the so called "habitable zone" (HZ) around 58. Eridanus, the River, some relate it to the Eufraat and the Tigris, some to the Nile, wend its way South-West of Rigel (Beta Orionis). 7. EPSILON ERIDANI, about some 600 million years old, somewhere estimated between 500 and 1 billion years old at a distance of 10 lightyears [10.50 ly]. It is surrounded by a ring of dust (asteroidbelt?) at about the same distance as that of the KUIPER-belt from the Sun and this might indicate the presence of other unseen worlds/planets. The density of the dust-belt in the Eridian system is the same as it would have been in our solar System about 4 billion years ago-about 600 million years after the Earth and other planets formed, toward the end of the period of the heavy bombardment [by the collision of Nibiru on Tiamat 3.9 billion years ago: see 'the Twelfth Planet, the Enuma Elish of Z. Sitchin]. This discovery adds to the growing body of evidence that planetary systems around other Stars are the rule rather than exception. Moreover Epsilon Eri provides a window into what conditions may have been like in the neighborhood of the Sun at a time when life was first beginning to emerge on the young Earth [just like ours 3.9 billion years ago]. In 2000, astronomers re-announced the discovery of a Jupiter-like planet around Epsilon Eri, with an orbit of 2502.1 days. In October 2002 morphological studies detected the dust-disk, and close to that one of the lowest mass extrasolar planets yet discovered, with a mass roughly one tenth that of Jupiter, it also has by far the longest orbit of any yet discovered [Nibiru is exceptional; 3600 years], with an orbital period of 280 years (Pluto has an orbit of 247 years). The presence of Epsilon Eridani C was disclosed by researchers at the University of Rochester using a new technique that does not use direct light from the star, but rather light radiating from the dust-belt surrounding it. Not all stars have large concentrations of dust, but those that do! like Epsilon Eridani, only at some 10,5 lightyears away, can display telltale patterns in their dust fields that may lead to planetary earth-(and who knows Nibiru/PlanetX-like) detection?